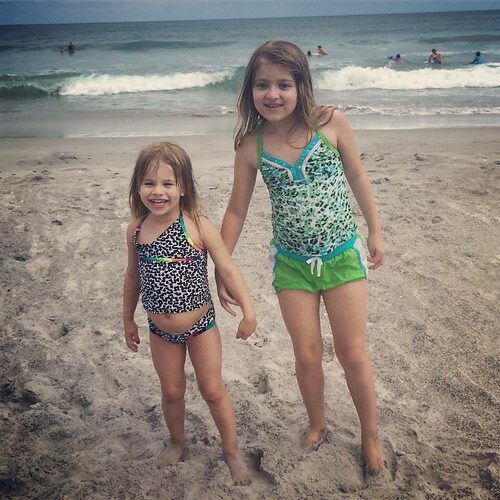 I had been thinking about taking the girls to the beach back in July, when Catie was on her summer break, but there were all kinds of stories in the news about people getting bitten by sharks, and it kind of freaked me out. I fully realize that it’s statistically far more likely that we’d get hurt in a car accident or a million other ways before anything involving a shark. But I already have a weird phobia about open bodies of water – I’m fine in swimming pools, but I hate boats, and at the beach I don’t go in the water past my knees. So just the idea of sharks was enough to keep me away. Then last week, I realized it was August, it’s been weeks since there have been any shark incidents on the news, and I really hated the idea of skipping out on something that’s become an annual tradition for our family. So, on Saturday, we loaded up the car and went to Wrightsville Beach for the day. Once we got to the beach, the girls had a blast, and you’d never know from the pictures I got that they were at each other’s throats in the car just mere moments prior. See? Total angels. Ha. Haaaaaa. 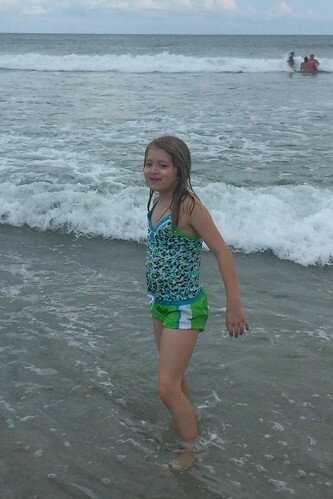 Catie has been taking swim lessons this summer, so she’s gotten a lot braver in the water, but she’s still very careful in the ocean. 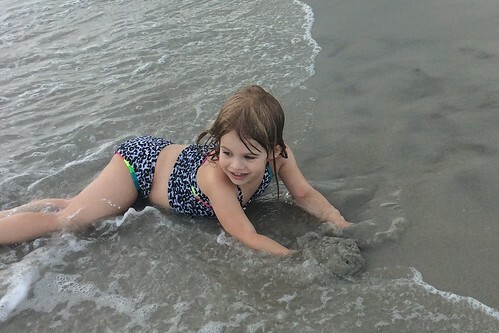 She found some other kids around her age and hung out with them, building sand castles and jumping waves. Lucy is a little more unsure about the ocean, but she had fun lying on the sand and waiting for the waves to roll up over her. She also had me carry her out to jump waves, which was fine, since we stayed in the very shallow water. After about 4 hours, when they’d completely worn themselves out, we loaded everything back into the car, grabbed some dinner, and headed home. Both girls slept most of the way, and I hated to wake them up when we got home, but they both needed showers after playing in the sand for so long. They got to bed way later than normal, but since it was a Saturday night, no big deal. That night, around 2:30 a.m., Lucy came into my room and said, “Mama, I throwed up in my bed.” Chris stripped the sheets off her bed while I cleaned her up. She spent the rest of the night and most of Sunday feverish, puking, and miserable. Poor little goose. Fortunately, it was just a 24-hour bug, because by Monday morning, she was completely fine. I kept her home on Monday anyway, because daycare wants them to be fever-free for 24 hours before they go back to school, and I wanted to keep an eye on her. Kids bounce back so quickly, though, she really was completely fine all day. And she was excited that she got to come with me up the street to meet Catie at the bus stop, since she’s normally at daycare and doesn’t get to do that. 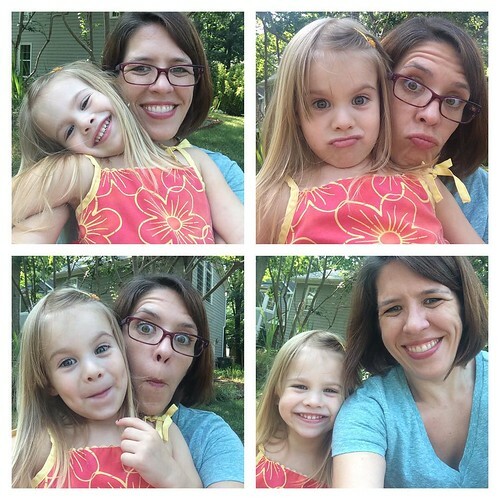 A series of “waiting for Catie’s school bus” selfies. Unrelated to anything: I’ve decided I’m tired of the girls having bangs, because their hair grows so fast and their bangs constantly need to be trimmed. So we’ve started growing them out. (Hence why Lucy’s hair is pinned back in those above pics.) It’s an annoying process, always trying to find hair clips in the morning, and convincing Lucy not to pull hers out halfway through the day, but I think it’ll be worth it in the long run. I know I’m biased and all, but I happen to really like seeing their entire faces. This entry was posted in Cate, Lucy, Single Parenting, Travel by Cindy. Bookmark the permalink. I have to admit, I would be too afraid to go there because of the recent news about sharks. Plus, I can’t swim. 🙂 But it’s wonderful ya’ll had a good time. As per the stomach bug, it’s been going around here in Southeastern Ohio. Yuck! Rachel´s last blog post ..When it rains it pours, I guess.